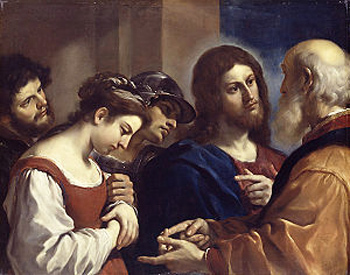 The Medicine of Mercy - New Teachings Lead to de facto Alterations of the Faith by Robert P. Banaugh, Ph.D.
Our Lord's condemnation here and in Mark (9:41) also applies to theologians and Church authorities who mislead the faithful by teachings that contradict the Magisterium - even if such teachings are derived from the deliberations of Vatican II. When discussing error, the Council heeded John XXIII's urging to omit the “arms of severity” and considered only the “medicine of mercy.” This significant change in the treatment of error was reflected in the removal of “The Admonishing of Sinners” from the traditional list of the Spiritual Works of Mercy in the new Catechism of the Catholic Church authorized and approved by John Paul II (see n. 2447). Consequently, because the Spiritual Works of Mercy are the good works done for the good of souls, the removal of the “Admonishing of Sinners” permitted the Conciliar Church to effectively minimize, or even eliminate, efforts to inform the faithful of the dire consequences of sin and to bolster its efforts to emphasize the temporal welfare of man. In so doing, the Conciliar Church greatly thwarted its mission to aid the faithful in the salvation of their souls. 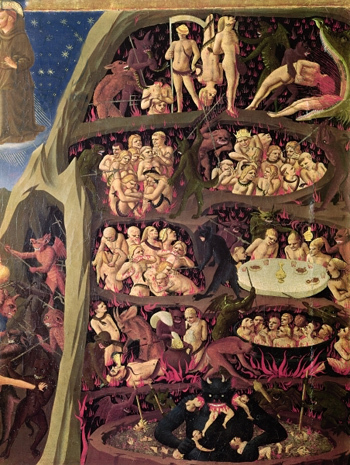 In fact, a mere six years after the close of the Council, Pope Paul VI noted: “The subject of hell is not heard of anymore.” (1) Sadly, throughout the remainder of his papacy the Pope did nothing to revive such preaching. “In proclaiming the risen Lord, Christians present the one who inaugurates a new era and announces to the world the good news of a complete and universal salvation, which contains in itself the pledge of a new world in which pain and injustice will give way to joy and beauty. 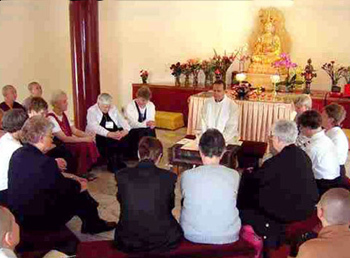 At the beginning of a new millennium marked by a clearer awareness of the universality of salvation and a realization that the Gospel daily needs to be proclaimed anew, the Synodal Assembly raised an appeal that our commitment to mission should not be lessened but rather expanded through ever more profound missionary cooperation” (Pastores Gregis, October 2003). A dramatic consequence of this alteration was publicly demonstrated at Assisi, Italy, on October 27, 1986, where the Pope urged representatives of non-Christian religions to pray to their false gods for peace. "`By appropriating insights of recent biblical studies and drawing on modern investigations of the history of theology and dogma, the post Vatican II ecumenical dialogue has led to a notable convergence concerning justification, with the result that this Joint Declaration is able to formulate a consensus on basic truths concerning the doctrine of justification. In light of this consensus, the corresponding doctrinal condemnations of the 16th century do not apply to today's ' partner." 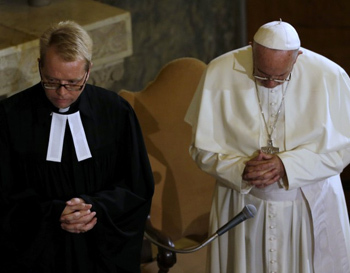 This Declaration, also called the Augsburg Accord, opened a new phase of the broader Conciliar Revolution in moving toward a one world religion. Its effects we are experiencing today. Romano Amerio, Iota Unum, A Study of Changes in the Catholic Church in the XXth Century, KC: Sarto House, 1996, p. 695.